Dr. David Simons, in his Man High capsule, oversaw projects that sent animals sent to Earth’s upper atmosphere via balloons. Eventually, he went himself (Credits: USAF/NMMSH Archives). How would cosmic radiation affect future astronauts when they rocketed into space? Dr. David Simons, from Holloman Air Force Base, set out to determine that by sending rats and monkeys aloft in balloons. The animals flew from Holloman’s Balloon Branch. Simons, who was Space Biology Branch chief of staff at the Air Development Center, reported on the results to the Aero Medical Associations 26th annual meeting in Washington. The Associated Press, in its coverage, said tissues did not seem to be negatively affected. The story, which the Alamogordo Daily News published on March 22, 1955, said “mice, exposed for 30 hours, showed no other apparent effects” other than that experienced by the black-haired mice, which was “a significant greying of hair.” Balloons had lifted these rodents to 90,000 feet altitude. The United States had been launching animals, including mice and fruit flies, into Earth’s upper atmosphere in 1947. Initially, they rode the German V-2, and the Aerobee sounding rocket. Rodents and flies reproduce prodigiously in a short span of time, allowing scientists to discern genetic changes that radiation might create. 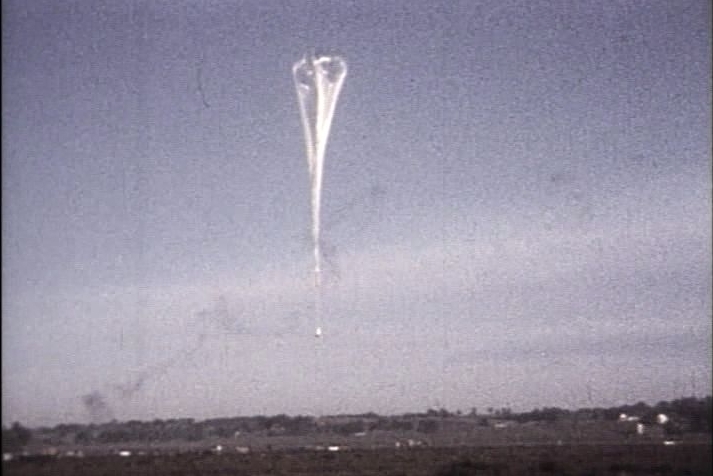 “‘By the time man flies into higher altitudes, he will know what to expect and will be better prepared for it as a result of … experiments conducted at Holloman,’” the ADN quoted an unnamed Holloman Air Development Center official. Balloon over Fleming Field (Credits: US Air Force). On Aug. 19, 1957, Simons sent up another guinea pig of sorts – himself. A graduate “with honors from the Jefferson Medical College in Philadelphia,” according to the website dgs.eu.com, he ascended to 102,000 feet altitude. For 32 hours his home was a very cramped gondola attached to a Project Man High balloon. 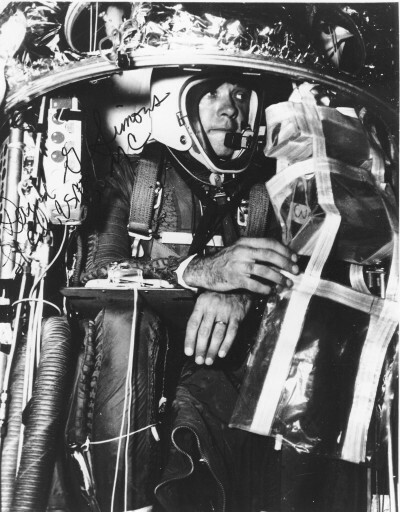 When Simons touched down the next day, not only had he investigated “the physical and biophysical conditions of the extreme upper atmosphere,” he’d also “set a new world’s altitude record with a manned balloon,” said “Animal Astronauts: They Opened the Way to the Stars” (Prentice Hall, 1961). Radiation he encountered apparently had no detrimental consequence; he was 87 when he died in 2010. Armed with the knowledge gained over the previous decade, Holloman, in 1958, began “training chimpanzees for space flight.” Researchers sought to learn whether a sentient being could perform tasks in weightlessness. Some scientists believed the brain would cease to function in such a condition. “Before man flies out into orbital space and comes back alive, one of our chimps will have to do it first,” “Animal Astronauts” quoted biologist Lt. William Ward. Michael Shinabery is an education specialist and Humanities Scholar with the New Mexico Museum of Space History. E-mail him at michael.shinabery [at] state.nm.us.